THAT'S AN ORDER: The Red Rocks' reuben is named for Rizzoli & Isles star Angie Harmon. Fame, fortune and ... food? The perks of carrying a famous moniker often mean free swag and screaming fans. For some local celebs, it also means their name in lights on a menu board. Dishes named after Charlotte personalities mean you can have a taste (or lick, whatever your preference) of your favorite Queen City star without a restraining order. Creative Loafing takes a look at some of the foodie fan favorites found in the city. Location: 2229 N. Davidson St. Claim to Fame: Local radio personalities Woody and Wilcox headline 106.5 The End, Charlotte's new rock alternative FM station, every morning from 6 a.m. to 10 a.m., proving it's never too early to rock. Taste of Fame: Suzie Ford, Noda Brewing Company owner and president, says the radio duo are definitely beer fans. "Woody, especially, is a huge beer nut," Ford says. The twosome approached the brewery in hopes of a partnership, and according to Ford, said, "We love beers, we want to help you figure out a style and we want to name it." Together, the team and brewery went through several options, and came up with three India Pale Ales. Customers and fans voted for their favorite. The popular IPA is now a permanent staple on the NoDa menu. "It's turned out to be an excellent partnership," Ford says. "We sell it around town, and they mention it on the radio and on the 106.5 website." Location: EpiCentre, 210 E. Trade St. Claim to Fame: Former Carolina Panthers offensive line coach Dave Magazu, and Boris Diaw, member of the Charlotte Bobcats from 2008-2012. Taste of Fame: The Coach Magazu BBQ Chicken Panini greets you as the opening image on Mortimer's website, the slideshow image rushing forward, much like the Panthers did in 2009, when under Coach Magazu they became the first team in NFL history to have two running backs each rush for over 1,100 yards. The panini is made with sliced BBQ chicken, bacon, pepper jack cheese, sliced tomato and sweet BBQ sauce, grilled on ciabatta with peppercorn ranch dressing. The Big Diaw is Mortimer's French dip (naturally, since the 6'8" basketball star was born in Cormeilles-en-Parisis, France) and honors the Bobcat who made Charlotte his home during his NBA contract. Marketing director Amy Ingraham says, "We have a lot of fun with the naming of our items, and are also launching a new menu with new names and a few fun back-stories." Practice hard, future sport stars, and your name may be there too. Claim to Fame: Debi Faubion, broadcast journalist and former news anchor of WSOC Channel 9 Eyewitness News. Taste of Fame: The WSOC newscaster was a Charlotte staple in the '90s, gaining popularity as a reliable voice of the region and winning four individual Emmys for her news and entertainment reporting. For more than 15 years, Faubion delivered the local news in her even voice, and after retiring, served as the president of the Mecklenburg Medical Alliance and Endowment. The folks of Laurel Market named a sandwich after the reporter, who championed for a healthy Charlotte. The Delight contains roasted turkey, tomato, a combo of leaf and shredded lettuce, sprouts and Dijon mustard on whole wheat bread. Celebrity Dish: Take your pick! Every single menu item is a name of someone connected to the locally owned and operated restaurant. Claim to Fame: Jimmie Johnson, NASCAR Sprint Cup series driver and television star Angie Harmon, of Law & Order and Rizzoli & Isles fame. Taste of Fame: "The method of menu item names selection is more secret than the Academy Awards," says John Love, co-owner of Red Rocks Café. The most popular celeb dish is Jimmie Johnson's Bleu Cheese Medallions, named after the No. 48 Lowe's Chevrolet driver. Love describes the mouth-watering meal as: "Three-ounce tenderloin filets, char-grilled to order, layered with Danish bleu cheese crumbles and a portobello mushroom cap, topped with crispy fried onions and served with garlic smashed potatoes and sautéed green beans." As for Angie Harmon, who makes Charlotte her home when not jetting off to film current seasons as detective Jane Rizzoli in the acclaimed TNT drama: "I have our Classic Rueben sandwich named after Angie," Love says. "It is premium lean corned beef, with sauerkraut, Swiss cheese and Russian dressing on Artos's marbled rye bread. 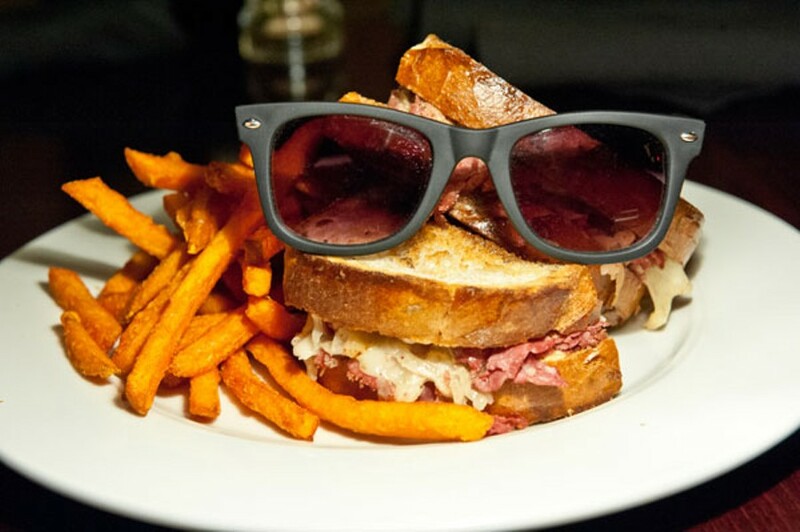 It is the best Rueben in town." Harmon knows her namesake meal graces the menu, and has had a bite. "Angie eats the Southern Salad mostly, but has eaten the Rueben because we made her," Love says. "She thought it was fabulous."